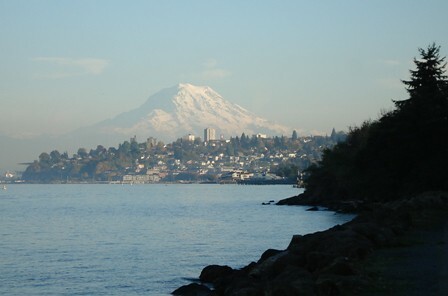 yesterday, jon and i went walking along ruston way. a much-needed break from creating, sewing, cutting, brainstorming, freaking out, smiling, squinting, and all the other good stuff that comes with getting your "stuff" ready for a vendor night. and, when we headed up the sidewalk, i paused to look at the scene in the photo above and thought to myself, "i can't believe i live here." i love the pacific northwest. in the weeks after artfest 2006, when the friendship between kelly and me was growing via email and phone conversations and meeting up in portland, we both began to notice how we were pulled toward artwork with words and stories, and that when we were creating ourselves, we were drawn to using words. before artfest that year, i had started writing short little bits of stories, usually beginning with "she..." i felt close to the idea of giving voice to the pushes and pulls and joys and sorrows within a moment in time in a woman's life. it was then that i started carrying a notebook around with me full time. at some point last year, i started carrying the paper covered moleskine journals. these journals are my idea journals. it is within them that i write and sketch and plan and hope and dream and list and live within serendipity. it is within these journals that i write my little stories when they come to me. yesterday, (after a quick "does this sound crazy conversation with kelly) i decided to create a few smaller flag sets and wanted to create them around a few of these stories. but my older "notes from the little room" moleskine was nowhere to be found (i had moved on to another one in the last few weeks). so, i tucked myself into bed and called on the spirits of all that is creative and wrote about being courageous, remembering your wings, and sitting in the quiet before drifting off to sleep. this morning, as i got the flag sets together and ready for embellishing, i turned to a spiral notebook i use for scratch paper and found a few pages that included some notes that would usually appear in my idea journals. there were notes for a couple of custom flag sets, early sketches of the anya tote, and two pages of little stories that must have demanded to be written that day. it is so interesting to peek into my own mind at times as i was able to do when i stumbled across these notes today. she spun her world anew.